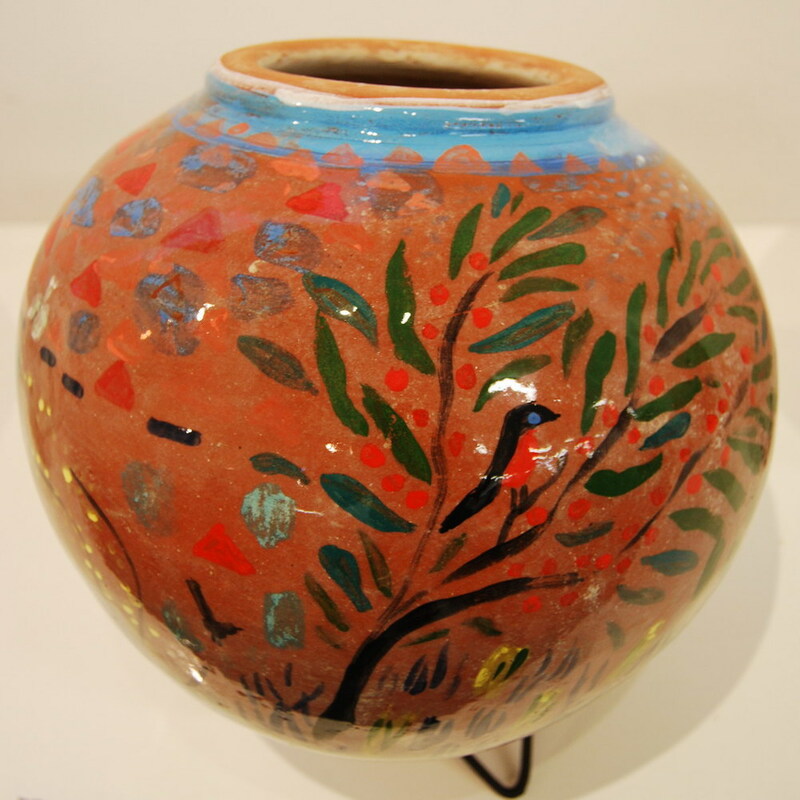 I valued the opportunity to work beside Ann Ferguson and visiting Rajasthani potters, Manohar Lal and Dharmveer, for the duration of their stay on my property in Central Victoria, Australia in early 2011. I observed Manohar Lal’s depth of knowledge gained from a heritage of generations and his lifetime of working with clay. The experience has made me aware of where the parameters of my ceramic practice lie. From the making to the firing, the journey through fundamentals of the ceramic process has been refreshing. The making processes, seemingly effortless throwing of large forms on the manual stone wheel to the beating, in stages, only at the right “tightness” into the large, light generously-rounded waterpot (mudka)was endlessly engaging. Building the kiln was the first priority. It is cylindrical, a double layer of old house bricks mortared with earth from an excavation site close by. After nine courses, a slightly convex floor was ingeniously built that stood the weight of the makers and then another nine courses completed the kiln. It was rendered with some local clay and a horse and straw mix that had been composting for the nearby vegie garden. The first firing demonstrated the differences between Northcote Terracotta and the clay with which they are familiar. It was only the 50% “cracked” rate of the first firing that convinced them to slow the firing, to about 800oc in 6 hours. We had to work with the weather to fire and fortunately had enough fine days to complete the required firings. Their practice is to warm the pots in the morning sun, they were then top loaded, initially standing on the kiln floor and finally balancing on the kiln rim. All is then artfully covered by an insulating layer of shards. The firings started early afternoon and were timed to finish in the dark so as to be able to read the evenness and temperature of the firing by colour. For interest, we installed a pyrometer. Manohar and Dharmveer were as interested as us to check the rate of increase.Their knowledge of fire also impressed us, subtly moving timbers for good combustion in the fire box (that being the lower half of the kiln) and ensuring evenness of temperature throughout the kiln by fuel placement. The available fuel in their home village is sawdust, firing with sawdust is hot and dusty and needs constant attention. The abundant dry timber surrounding the workshop made for easy firing. The morning after a firing, Dharmveer would be on the rim of the kiln unpacking. A sharp rap to each piece brought forth resonance that indicated whether the piece was sound or cracked. The sound pile of mudka forming on the ground around the kiln, brought smiles to us all.On closer observation, the subtle markings of a low temperature wood fire on the mudka had Ann and I thinking about the future use of this kiln and firing techniques for our own work. The bush around Sandra Bowkett’s home and shed near Tallarook is unique. Large granite boulders are scattered precariously atop the steep-sided valley, with Pulpit Rock looming directly above the rustic shed. For four weeks over April and May 2011, the rushing waters of the creek kept time to the ‘pat, pat’ of Manohar’s paddle as he beat a stream of crudely thrown pots into fine-walled mudkas — the traditional Rajasthani vessel for carrying and storing water. Some special mudkas were made to be the elements of the Tallarook Stacks — a ceramic sculpture project funded by Regional Arts Victoria. This required the creative collaboration of Manohar, Sandra, myself and members of the Tallarook community. The Crosshatched team were introduced to the community at a Tallarook Farmer’s Market which takes place at the historic Mechanics Institute Hall — the installation site for the completed sculpture. The community were offered a variety of opportunities to participate in the project. They could gather earth materials from their properties for the colouring of the elements of The Stacks, join open workshop days and participate in firing the traditional kiln. We were inspired by the landscape — the project giving the makers an opportunity to experience it deeply. Initially, we battled with limited common language to explain the nature and function of the project to our Indian team members who had honed their skills through a lifetime of repetition of fine functional forms. It was difficult to justify the need for ‘organic’ shapes resonating with the local environment. Manohar described the Australian clay, Fenney’s Buff Raku, as ‘tight’, hard to throw on their traditional manual wheels, and consistently found other more familiar work priorities such as making his traditional mudkas and constructing the kiln. Finally after five worrying days, we broke through the resistance, softened the clay and The Stack making began. Manohar completed eight beautiful thin walled Fenney’s mudkas in two days, along with all the other jobs! Other team members then struggled to process the flow of drying pots. They could often be found urgently searching the bush for materials that would imbue the pieces with the mark of the land. The surfaces of the elements were painted with layers of local clays, from white to reds and impressed with stones, bark, sticks, grasses seeds and leaves.They were worked and reworked as the forms dried, often by different hands, until a satisfying outcome was achieved. Initially, they were fired to stoneware in a gas kiln, then many were refired with subtle earthenware glazes to enhance textures and enliven surfaces. The Stacks, made up of about 30 elements are now complete and our Indian collaborators back home in their village near Delhi. Sandra and I have organised the placement of the elements, arranging and rearranging the pierced forms around three central steel poles. Each element is an appealing object and as a tall stacked form, impressive. We look forward to seeing them installed at The Tallarook Mechanics Institute Hall. When Sandra Bowkett approached me regarding a cross cultural collaboration at Pan Gallery, I wasn’t entirely sure what she had in mind but I sensed a craft event with authenticity and substance. Crosshatched 2011 aimed to help improve the working conditions of fellow potters and encourage an affiliation between traditional Indian craftspeople and our local ceramic community. Over the next few months, plans evolved and after a nail-biting week waiting on travel visas there was a celebratory air when Manohar Lal and Dharmveer arrived. Undeterred by jet lag, the potters embraced a day in the workshop space at Northcote Pottery Supplies with gusto. Beautiful mudkas were made in the traditional manner; the potters crouched at a stone wheel set in motion with the rhythmic nudge of stick in notch. With smiles and nods, the potters welcomed the attention of onlookers, patiently posing for photos while maintaining their constant productivity and skilled craftsmanship. Twenty talented Melbourne artists had warmly received the invitation to decorate these beautiful vessels for an auction to raise funds to build a more energy-efficient kiln in Kumhaar Gram, the potters home village. Merging traditional and local materials and techniques required some problem solving and presented the logistical challenge of timing the making, drying, decorating and firing. It wasn’t all smooth sailing, but any hiccough was overcome with a combination of enthusiasm, knowledge and skill from all the artists involved and Northcote Pottery staff. The artists’ responses to the forms were wonderful — all approaching the task with great generosity of spirit. Eyes gleamed with possibilities for the rounded, expansive surface and hands trembled with respect for the traditions encapsulated in each piece. On one particular day, the workshop space hosted many artists with Manohar and Dharmveer in attendance to answer questions with the help of a translator. As slips and underglazes were applied, we learnt of the potters’ history, their current practices and hopes for maintaining the craft in the future. Installation quickly followed a hectic week of firing and glazing. The artist-decorated mudkas surrounded a magnificent stack of traditional vessels made and fired at Sandra’s property in Tallarook. This stack diminished and rose as mudkas were purchased and more were added. A front page feature in the local paper helped spread the word beyond our established ceramic audience and I was delighted to talk to many visitors who engaged with the works quite emotionally — often with tales from travels in India and other personal stories relating to traditional craft objects. The well-attended closing event showed that this project had captured the hearts and imaginations of craftspeople and craft lovers alike, and the charity auction goal was attained. Enthusiasm for this project was due, in no small part, to the nature of the mudka and what they represent — craft in its truest form — born from need, functional, practical and beautiful. The effortless grace of these vessels springs from refined technique and inherited knowledge, fundamental elements of a craft that is well worth preserving. Text in italics was added for clarity when transcribing this journal. It has also been edited for the public domain.This project is the outcome of a request from Rahul Barua, (RB) Director of South Asia Foundation (SAF) when at Kumhaar Gramm , formally known as Hastal Village in November 2009, “can you organise another trip to Australia for some potters?”. His intention being that they would be able to generate a reasonable lump sum of money that would be useful for the work of SAF, i.e substantial home building or kiln reconstruction. There has to be more in it than money making for a good outcome for all. 14.1.10: The plan is beginning…. This evening as Will my son and I were shifting dry timbers from the front of the house to reduce any bushfire load I began thinking. This long dry thin wood would be great for firing a kiln, remembering the 300 brick woodfire kiln plan recently received thoughts then shifted to a Rajasthani kiln and an idea gathered momentum. Manohar Lal (ML) and Dharmveer (D) the two potters that had been asked to come to Australia could centre their mudka making ( traditional waterpots) and firing here. For the firing we could invite the interested to participate in a weekend of kiln building, and the next weekend an evening food and firing event, it makes me excited to think on this. 15.4.10: And now to the machine- the dream above needs a vehicle. Just spoken with Multicultural-Arts Victoria and positive, Jill responded immediately to the possibility of partnering, another flurry of light to keep the flame ignited. Nothing came of this. 16.4.10: Sat down to edit the letter of introduction for the project brief and the frisson of anticipation is there. 27.8.10: The programme progresses. In an effort to fit the potters tour to Regional Arts Victoria ( RAV) funding guidelines have tailored a plan The Tallarook Stacks. If we get the funding this will be the focus for their stay. 29.11.10: We have the RAV funding, this was the best news to receive on my arrival back from India. I had been in India with a Ceramic Victoria Exhibition, Golden Earth. Had met with R.B on my last day and he was keen for a third potter to come plus 2 from SAF, I was not keen but why should I be so precious about my stress levels when it would give another the opportunity to come to Australia. Although the potters of Kumhaar Gram have a vested interest in feting me, I get from them genuine care and warmth- use the love word Sandra, expressed in an unpretentious way. The act of them coming to say goodbye was most appreciated after a most challenging day. I am not alone in my appreciation of the people from Kumaar Gram. The tour group I took there during the exhibition also experienced the integrity of their life and hospitality, Diane Kennedy saying it was the best day of the tour and Rick Scoff also expressing appreciation and that being his first day in Delhi as did the others. At this moment I have to put into perspective RB’s concerns about ML not participating in SAF community activities. Sometimes I wonder if his previous trips to Australia put known family and community life out of kilter. ie when you know there are other ways to have a life do you then struggle with the life you are dealt. A phone call last night with RB expressing his concerns about M.L but now D is in the good books. I think there could be community resentment to M.L having a third opportunity to come to Australia. Another factor in the project is now the Goan connection. To get funding for ML and D’s airfares a convoluted track via Goa Handicrafts is being followed which means two potters, fine and exciting and the Managing Director, not so fine will need to be accommodated ( he did not come). RB knows my reservations i.e time and energy taken from the main game but I am sure we will manage. On other matters, am finally formalizing the Crosshatched logo, Adrienne Campbell and I are working on it. I have decided to own the identity, with others coming and going as it works out. The workshop site is almost complete, Peter my partner has finished the handcrafted shed, have done a lot of cleaning up, now ready to pour the concrete floor and then move on to the next stage for me, buying clay and setting up. The several spokes to Crosshatched 11 are coming together. Conversations with artists invited to paint mudka have happened and info to go out. As a fundraiser for a new kiln in Kumhaar Gram local artists had been asked to paint mudka that would then be auctioned, at the same event, at Pan Gallery, a pile of M.L’s mudka would be exhibited http://pangallery.blogpot.com'. Benalla Art Gallery have changed focus, we now go there, by them pulling out one event we now have room for another local school. Tallarook Primary School workshop confirmed. Maquettes made for possible Stacks and meeting with Mitchell Shire re heritage appropriateness complete. Ann and I have gone over the calendar and we have a clear picture of our commitments. Accommodation sorted. Tom ( Wukwuk resident) will move to the spare room earlier than he anticipated and so the hut will be available for all Indian men. Have bought a single bed frame to go in the lego room ( small room where the boys used to play lego, before that it was a bathroom, it then went on to be the x-box room but still retains the name lego room)to set up for more space for Ann. And many vegies, beans, cucumber and daikon radish in the garden. Spoke with Ravish ( a local Hindi speaker) about catering and interpreting and I think that will work. Home Ed flyer has gone to Steph to send out. Friends Stephanie Pollock and Glen Rodgers home educate their 3 children and are part of the Victorian Home Education network. I continue to be excited to have the potters here. RB enthuses about what the Goans are doing i.e women getting together as an active group and the invitation to visit there when next in India is exciting. 25.2.11: Have just heard one of the Goan potters is a woman, so this is great news, finally a female potter coming here. 6.3.11: Introduced The Stacks to Tallarook today at the Farmers Market other than a few, not a very enthusiastic response- we need to enrol more of the community in this project, how to go about that? 11.3.11: In writing a press release and refocusing on mudka and bringing the two streams The Tallarook Stacks and exhibition at Pan Gallery together brought excitement and renewed enthusiasm back to the project for me. 19.3.11: Had a call from RB, 1hour before business closed for the weekend and M.L and D are yet to get their visa- they were to leave tomorrow-Sunday- I was incredulous, with all the lead time surely this could have been managed. We do have a little spare time but the intention was to relax the pace-I am now calmer about it all and assume they will get visas- however there is the possibility that that will not be the case…..and looking forward to picking up the Goans early Monday morning. 25.3.11: The Mall Melbourne. Arun and Verodina are in Priceline shopping- we have had a good day- train to Melbourne, coffee at The Journal, Ian Potter Gallery, Yarra walk, chocolate shopping, Lindt and Darrel Lea, I have now had enough shopping. Now nearly a week since hearing M.L and D have not got visas and still no word despite making contact with RB each day and hearing the efforts he is making to finalize. Last night and this morning began moves for alternatives and cancelling process. It is a near unbearable wait and I have at times been furious, as on other occasions I feel I am taken to the limit and then all comes through. Will it be the same this time? M.L and D must be beside themselves-lost of face and anxiety at not understanding the process, at least I know what is going on. But it has been a good time with Verodina and Arun, they are very easy going and good company. Great day yesterday with the Home Ed group, A shed full of enthusiasm and at times the silence of the absorbed. V and A offered different approaches to modelling small animals that the kids handled well . They were both most relaxed. Had a kiln load of little Ganesh, cows and other creatures, however, it has been hard to distract myself from the M.L and D hicupp..
31.3.11: Yesterday was a day of positive signs after the phone call from the High Commission in Delhi the night before, however it was not until 11pm last night that I actually got word that they did have their visas and the question from RB. “When should they fly”? “A.S.A.P. as in tomorrow” Sure was the reply from R.B. so they fly tonight at 11pm. 4.4.11: At the shed. Ann is tampering Anne Fraser’s form ( made on Saturday at a Stacks workshop) . M.L thumping mudka, D quietly cutting/soaking water slosh softening clay and myself, patterning with rock and earth a Stacks element, the wind in the trees and beyond that, some birds, and now M.L humming, the near silent whirl of the wheel as D turns his little pots, a blissful time. Early morning discussion with Ann- her concerns about what evolved the afternoon before ( I was at my mothers 80th birthday dinner) M.L and D went about their own stuff, mudka making and small pots, where was the Stacks projects progress? no amount of talking from her had made an impact. 7.4.11: Lunchroom Northcote pottery- a day of mudka making for the fundraiser, comments by the 3 artists who have seen the mudka, ‘they are much bigger than expected and round bottoms”, Jan Saric and Truly fascinated by the making process. Find attached the artists’ statements. Re-capping, Ann and I had been anxious by the lack of movement on making The Stacks mudka, the clay had been prepared and through Ravish determined that it was O.K, was it the off centred nature of the forms? from the models and drawings shown to M.L in India this was not a problem, was it a timing factor? it would take time away from making own mudka making, finally after two large mudka were complete , yesterday morning he threw the first stage of 8, later in the afternoon beat the top half and this morning finished, off centred the hole and beat one edge/side in a little. And all seems fine for Sunday These elements needed to be available for participants to access for a Stacks workshop. 17.4.11: Thank the Gods- 3.30 p.m; I am happy, have just got the pyrometer going a device for indicating the temperature in the kiln and it showed 100 degrees c, starting at 1p.m. that is the slow rise we needed, but now 50 degrees in half an hour?? should just leave it to M.L and D it is their pots in the kiln. The clay we are using this year is different from previous times and needs a much slower firing, M.L and D are used to firing in about 4 hours, what we have been advised to do in about 8 by Northcote Pottery. So this is blissful, a beautiful sunny afternoon at the shed. D has been throwing dishes, Peter tinkering in his shed, M.L squatting feeding the kiln, and myself, concerned that it is firing too fast but happy for him to reap the consequences. I have been looking forward to this time, to have time, to record the experience to date in a peaceful mode, my head has stopped racing, many contributing factors for that. M.L now has about 16 mudka finished; The artists’ painted mudka have been successfully fired and the artists were enthusiastic about the process and experience; The Stacks have progressed, will fire the first load tomorrow, the techniques have evolved and although had few participants the ones here have contributed enthusiastically and with sensitivity and originality. Anne Fraser has sent forms in new directions. It has been pleasurable working quietly on these elements, the robust forms receptive to texturing and using the locally found clays for colour; Ann, M.L and D are an easy team to work with, generally M.L and D work on their own stuff unless there are Stacks to make. Once we began and a few made M.L got the idea of beating the form to shapes we could use. He also experimented with beating some wattle into a mudka, unfortunately they were 2 that cracked in Anne’s kiln. We had also modified the way we changed the forms to less severe. We were having pieces fired in Anne Fraser’s kiln in particular the Stacks elements as she was able to fire to a higher temperature, making the pieces stronger; The dinner-the festival finale that wasn’t a finale is over. Ravish had offered to help. The food was great, and there was just enough- and the black sticky rice with quince was a hit; RB arrived yesterday morning, Ann collected him, he was here for the afternoon and stayed at the Wilmot’s, our neighbours, has gone with them today to Simone’s their son, a film maker who has done a lot of work in India. M.L and D were happy to see him here. We now have another 2 weeks together, I think I can now fully relax and enjoy the teamwork and production with a few public events for bursts of energy. 18.4.11 Café break at Fed Square on a sightseeing day in Melbourne. Ann has taken the men on the circle tram while I found a park as well as some time for a coffee. HMMM the firing, the pots look great but 50% crack rate not good, but the cracked are being utilized as shards for a kiln cover. The local artist’s painted pots at Pan Gallery look great, I look forward to having a good look around next time, M.L was all smiles when he saw his pots painted by these wonderful artists. 20.4.11: A regression re relaxation level. 2 hectic days chasing my tail. So back to the local artist’s day. The 9 participants apparently had a great day, with so many people in the space although it worked, I found it overwhelming , and M.L and D just worked away. Anne Fraser returned fired elements, generally they look good. It will now be the time to look at then and begin to critically make what is needed. Time for dinner, Ann is cooking subje and the men chapparti. 21.4.11: Another all over the place day for me. Shopping with R.B, collected extra mudka stands and collected Kevin Murray from the train. R.B and he had lots to talk about and M.L and D worked on, M.L has about 30 mudka and D 100s of little pots. D had been invited the supply as many as possible tiny pots to cover a table at Small Things Gallery Northcote Pottery at the same time as the exhibition at Pan Gallery. 26.4.11: Morning in Melbourne, at my sisters home, we had come to Melbourne the day before so D could get to the beach and generally have a break from home, or was that me?, we had some take- away from Balas’ that was well received and then an early night for those two, I sat and watched Bride and Prejudice for the 10th time. Back to the morning. Coughing, banging- ginger on cutting board, for chai, the chortling of two contented and comfortable men. D has just remarked, no tension here. We then went on into the city. Visited Vic Market. M.L buying some hand cream and then onto the camera shop strip and D bought a small digital camera. 28.4.11: Final workshop complete. Relished the washing up of the last of the lunch dishes. Was a good day with the home -ed crew. For many of the workshops I had prepared lunch, although this was enjoyable and much appreciated it was a lot of extra effort and a little stressful. Would there be enough food etc? 29.4.11: The day of the finale event at Pan Gallery. M.L and D have been carefully pressing their clothes for the day, I feel conscious that I will not be making the same effort, having a pressure koi nahi suba , no pressure morning. Lygon St Café before the auction, hopefully lots of action, the bids so far are a little low, let’s see what happens. M.L and D are relaxed and taking in the slide show and all. The evening was a great success by many measures. The auction although many of the pieces were undervalued the amount raised was above the target. There was a great feeling of good will at the event, people enjoying the exhibition, the auction activity, the food, wine and the demonstrations. Sophie Milne, Pan Gallery Director spoke of this exhibition being the last for Pan and how it had been a great concluding event, Kevin Murray spoke of some background to Crosshatched pulling many threads together insightfully and the other event that was happening that night i.e a royal wedding. 3.5.11: M.L and D are on their way to Kuala Lumpar and I was on my way to clean my workshop, however I was prompted to take a moment to begin to reflect on the past month. At this point I am again struck with the fact that those two men, being so self-sufficient and quietly confident were easy to live with, their ability to sit in warm places, by the fire, on an east facing rock in the mornings and warble was endearing. The lack of a common language at times frustrating but generally, with a word or two understood and some actions, communication happens. D was nearly inconsolable at the airport, he kept looking away while we had a coffee and did the paperwork, and at the departure door, after very teary to sobbing goodbyes and hugs kept returning to us, finally we had to leave, under his direction. The check-in was without problems, no overweight issues with these two,( D bought 3 objects at the Salvos and camera. M.L $20 worth of op-shop cloths $10 chocolates from Safeway and the Vic market hand cream.) It is difficult to express my deep feelings for these two men, the way they conduct their lives ( care with appearances, washing and ironing valued clothes with care, refined eating habits, economy of graceful movements generous with chai and chapparti) and overriding all, their gentle and good natured way of being. I respect their craft, the depth of knowledge of clay limitations and strengths, structural knowledge of building the kiln and firing, the nature of burning wood and how to get the most from it. The artfulness of stacking the kiln and creating the covering layer of insulating shards. Working with the weather, patiently waiting to get the ideal day, warming the pots till midday, packing, firing 1pm to 7pm to get some night time viewing to judge the temperature by colour. Assessing each piece as it comes from the kiln as it is unpacked with a sharp tap, the retort indicating sound or cracked, stacking the car with minimal packing but stable….. The only interest in money and figures was the issue of the ticket costs. I am not clear what R.B has told them re re-imbursement. 6.5.11: A cloud had passed over the euphoria of the tour, after speaking with R.B last night and broaching the ticket issue.” It needs to be taken to the community” My temperature went up. After this conversation we had a series of heated emails discussing this issue in the light of the SAF work in the village and M.L and D response to it, R.B was at pains to discuss it at length which I appreciated. It has since been resolved they need to setup/be involved in a community self help group before the money will be reimbursed. Thanks to the 2011 Crosshatched Team Ann, Manohar and Dharmveer for an inspiring time together. There are many others ‘too numerous to mention’ but special thanks to Peter for creating a great shed for us to base the project and to he and Will for their patience for another period where I am ‘absent’ persuing my passions. To the household, Peter, Will, Jenny and Tom for embracing my visitors once again as family and adding support when needed.